Of all the neurotransmitters and hormones that may be involved in depression, serotonin and the hormones of the hypothalamic-pituitary-adrenal (HPA) axis probably play the most important role. They also appear to share certain physiological pathways, which would keep them interacting constantly. The recent consensus that the hippocampus, a structure in the limbic system, also forms an integral part of this “stress axis” has provided a better overall understanding of the complex phenomenon of depression. It is thus becoming increasingly obvious that hyperactivity in the stress axis is not just a side-effect of depression. The stress axis and the serotonergic systeminteract in many ways. These interactions are probably among the reasons that the level of glucocorticoids circulating in someone's body greatly affects their mood, partly because of their effects on the hippocampus. Long associated with cognitive processing of information, and with memory in particular, the hippocampus has more recently been recognized as an integral part of the circuits that control our moods and emotions. The fact that depressed patients often have a variety of memory deficits also points toward the involvement of the hippocampus in depression. Epileptic seizures that are focused in the temporal lobe produce massive loss of neurons in the hippocampus and neighbouring structures. In patients with epilepsy, depression is the most common psychiatric complication, and patients with temporal lobe seizures are more likely to suffer from depression than patients with other forms of epilepsy. These observations thus strongly suggest a link between depression and damage to the hippocampus. Though depression involves an overall reduction in brain activity, some parts of the brain are more affected than others. In brain-imaging studies using PET scans, depressed people display abnormally low activity in the prefrontal cortex, and more specifically in its lateral, orbitofrontal, and ventromedial regions. And the severity of the depression often correlates with the extent of the decline in activity in the prefrontal cortex. 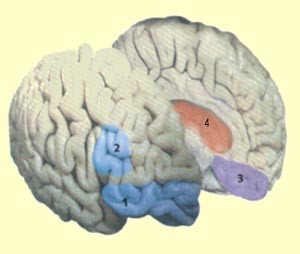 The prefrontal cortex is known not only to be involved in emotional responses, but also to have numerous connections with other parts of the brain that are responsible for controlling dopamine, norepinephrine, and serotonin, three neurotransmitters that are important in mood regulation. More specifically, the lateral prefrontal cortex seems to help us choose a course of behaviour by letting us assess the various alternatives mentally. The orbitofrontal cortex seems to let us defer certain immediate gratifications and suppress certain emotions in order to obtain greater long-term benefits. And the ventromedial cortex is thought to be one of the sites in the brain where we experience emotions and the meanings of things. The two halves of the prefrontal cortex also seem to have specialized functions, with the left half being involved in establishing positive feelings and the right half in establishing negative ones. 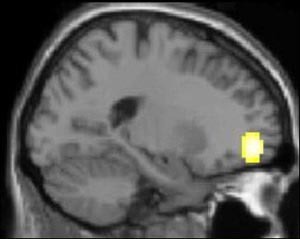 And indeed, in depressed people, it is the left prefrontal cortex that shows the greatest signs of weakness. In other words, when people are depressed, they find it very hard not only to set goals in order to obtain rewards, but also to believe that such goals can be achieved. In healthy people, the left prefrontal cortex might also help to inhibit the negative emotions generated by limbic structures such as the amygdalae, which show abnormally high activity in depressed patients. In patients who respond positively to antidepressants, this overactivity is reduced. And when the amygdalae remain highly hyperactive despite antidepressant treatment, the likelihood of a patient's relapsing into depression is high. It is also interesting to note that when someone's left prefrontal cortex is operating at full capacity, the levels of glucocorticoids in their blood are generally very low. This follows logically, considering the harmful effects that high levels of glucocorticoids have on mood. Brain-imaging studies have also shown that in patients with severe depression, the volume of the two hippocampi is reduced. This atrophy may be due to a loss of neurons that is also induced by the toxic effects of the high levels of glucocorticoids associated with recurrent episodes of depression.The extent of atrophy in the hippocampus even seems to be proportional to the sum of the durations of the episodes of depression, and depressions that are treated rapidly do not seem to lead to this reduction in hippocampal volume (see sidebars). In an experiment using functional magnetic resonance imaging (fMRI), a group of healthy people and a group of depressed people were shown clips from sad films. Both groups were asked to try to suppress any feelings of sadness that the films elicited. The image here represents the arithmetical difference between the brain activity levels of healthy subjects and of depressed subjects. It shows that the healthy subjects had more activity in the lateral portion of the orbitofrontal cortex (Brodmann area 11), which plays a major role in regulating emotions. This is not surprising: since depressed people have a lot of trouble in inhibiting their negative emotions, it makes sense that their orbitofrontal cortexes would be less active than those of healthy people. Why would evolution have allowed the human brain to develop and maintain circuits that can cause depression? Some potential answers can be found in the animal kingdom. When an animal is faced with a disagreeable situation and can neither fight nor flee, it responds with inhibition of action, a state that resembles depression. The status of the most subordinate animals in a hierarchy may also have an adaptive value, by preventing them from engaging in fights that could be very costly, or even fatal. This would also explain why in human beings today, depression is often triggered by events that undermine self-confidence—the equivalent of being defeated by a more dominant animal.